The introduction of an Alabaster colour finish combined with a perforated slat aluminium blind bring a crisp, clean option to this very popular range. Perforated slats bring more graduated light control than standard slats and are ideal for very bright rooms which require finer control. 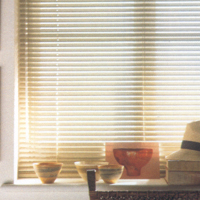 Easy to fit top/face fix brackets mean a quick fix solution and with a facility to cut up to 75mm from each side of the blind and a drop of 160cm allows these blinds to fit almost every application. New super light Aluminium strip offers absolutely the perfect medium for this range of stunning fashion blinds. Offering a positive cord lock and modern wand tilt mechanism the super slim 25mm slats lift into a very tight stack.